what it is going to be like, that cottage of darkness? When I read this Mary Oliver poem on CBC Radio’s cross-country Morningside program in honour of CBC broadcaster Peter Gzowski after his death in 2002 I was told later that Mary Oliver’s books had sold out across the country that day. And that demand for the poem was so great CBC posted it on their website. Did all her books sell out? Really? Whether or not they did the point was made: this poem had struck home. Like so many of Oliver’s iconic poems – The Journey, The Summer Day, Wild Geese and many more. When American poet Mary Oliver died today at age eight-three an argument could be made that the U.S. had lost its most popular and best-selling contemporary poet. Again, true or not, point made. Oliver was an extraordinary force in English-speaking poetry. And in the words of former editor of Poetry, Christian Wiman, at the time of an event about fifteen years ago: the most famous poet in America. And she won two of the most prestigious prizes for American poetry, The Pulitzer (American Primitive, 1983) and the National Book Award (New and Selected Poems, 1992). And I feature When Death Comes on the day of Oliver’s death as the best way to celebrate this important American poet. A poet whose poems I have cherished for years. And a poet, I think, who embodied all she aspires to in this poem. If death is a door then Oliver for sure walked through full of curiosity. The same curiosity she shows in all her poems. The way she paid such attention to her world. And I would say to her: Mary, for sure, you did not simply visit this world, you were one of its great residents! All this praise from me not withstanding this does not mean Oliver was universally loved particularly within the upper echelons of the American poetry establishment. There she was often publicly disdained and derided. Dismissed as a “nature poet”. But take a deeper look. Her poem Tecumseh (on American native leader and warrior, Tecumseh,) and her poem on Dachau and Mengle (1945-1985: Poem for the Anniversary) and her poem Rage (on her father’s abuse of her) and many others. A good example of the critical derision of Oliver is is this excerpt from American poet and critic William Logan in his book review in the New Criterion in 2008. 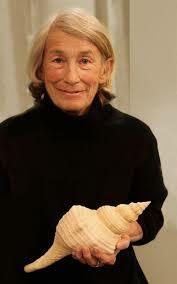 Mary Oliver is the poet laureate of the self-help biz and the human potential movement. She has stripped down the poetry in Red Bird until it is nothing but a naked set of values: that the human spirit is indomitable, that the animal spirit is indomitable, that she loves birds very much, that she loves flowers very much, that even her dog loves flowers very much. . . . If we trust the landscape of her poems, Oliver lives in a vast nature preserve she polices like a docent, strolling from bush to bush from beast to beast (I’m told the wildlife of Cape Cod have asked for a restraining order against her). Logan is noted for his snarky and downright mean reviews. This is one of those for sure. And for sure Oliver’s poems can sound preachy at times, and at times feel prosy. Where’s the lift off, the lyric ah ha? But also for sure there are countless poems of hers like The Journey that can be read a hundred times as I have read it (literally) and still retain its emotional punch, its lyric immediacy. My bet: Oliver’s poems will still be celebrated long after Logan is long forgotten. And that’s not to say he isn’t a fine poet. He is. But Oliver in my opinion has that something extra. This discrepancy of opinion about Oliver was beautifully expressed in a 2018 book of essay’s: He Held Radical Light by the critically acclaimed American poet Christian Wiman whom I quoted above. He is now a professor at the Yale Divinity School and previously the editor of Poetry, easily the most influential poetry publication in the U.S.
Mary Oliver from Devotions – The Selected Poems of Mary Oliver, Penguin Press, 2017. What I had objected to in my review of her most recent book was a certain transactional element in her relationship with the natural world. The poet goes out for a walk and gets a daily dose of awe, as if nature were an epiphany machine. It ought to be harder than this, I had thought to myself. And then, as I worked my way backward through all her work, it suddenly was: a poem midway through American Primitive [Wiman is mistaken: from The House of Light, 1990] about an eerie owl striking some hapless and never-named creature. It was spare and unsparing, wholly alert and disquietingly narcotic at the same time. I read it over and over. I practically had it memorized by the time I left the office promptly at five, a clerk of verse, and with the deathless prose of my first official introduction tucked carefully in my coat pocket, headed out to meet the most famous poet in the country. This entry was written by Richard Osler, posted on January 17, 2019 at 6:39 pm, filed under Poetry and tagged Mary Oliver, William Logan. Bookmark the permalink. Follow any comments here with the RSS feed for this post.